Bestselling author Valerie Wilson Wesley grew up an army brat who moved around to different places. Now she is a celebrated novelist who has been featured all over the country and beyond through the stories that she weaves together. No matter what she has done in her life, she has always been a lover of words and it shows in her newest book OF BLOOD AND SORROW that Conversations read this year, a book that is part of the Tamara Hayle mystery series. So who is this woman that has enthralled readers with her universal characters? She gives you a clear glimpse in this exclusive interview. Valerie, it has been a long time coming. Thank you for taking out time to speak with Conversations. For those who aren’t familiar with your work, why don’t you tell our readers a little about yourself. I’ve had several careers, but I’ve always been a writer. I’m a former teacher, an editor at Scholastic News, and I was executive editor of Essence magazine for a number of years. I wrote my first novel, Where Do I Go From Here for young adults in 1992; it’s no longer in print. When Death Comes Stealing, the first mystery of my Tamara Hayle series came out in the mid-1990s and Of Blood and Sorrow, the eighth Tamara Hayle, was published last year. In between mysteries, I’ve written three novels, Ain’t Nobody’s Business If I Do, Always True to You in My Fashion, and Playing My Mother’s Blues as well a the Willimena Rules! series for children. With many books under your belt, the main character of your mysteries, Tamara Hayle, has been celebrated by readers and critics alike. What do you think about her has resonated with so many readers? I think that many readers find themselves, or parts of themselves, in Tamara Hayle. She’s a single mom coping with raising a teen-age son alone, no easy task these days, yet she always manages to take care of business–make a living, care for her child, and solve her case. And she does it with style and a sense of humor. She also manages to find a little love on the side. too, which always adds some zing. Readers tell me they like her because she’s funny and tough, the kind of friend everyone needs in their life. People often ask me how I found her character. Truth is, she’s a bit of all the women I admire–my sister, friends, and all the smart, savvy women I knew at Essence. Speaking of the critics, there have been reviews of your novels in some of the most celebrated media outlets in the business. Has it surprised you that your career has been so highly praised? It’s always a delight to get a good review, but I’ve certainly had my share of bad ones. You take what you can use from each review–good or bad–and then go on to the next book. The important thing for a writer to remember is that she has to be her toughest critic. My advice to students in my creative writing classes is to write, edit, let it rest for a few days, and then read it again with new eyes. Never write and edit during the same period; you’ll never finish the story. I guess an obvious question to ask is what led you to mysteries? I’ve always loved mysteries, even as a kid. I remember going to the library each week for a new Agatha Christie. I also loved the stories of Edgar Allan Poe. I love writing mysteries because you can do so much with the form. It’s a genre which easily bends to incorporate unique settings, styles and characters. Although they are formulaic--there are always red herrings and a denouement–a writer can make the form her own. Was there ever a doubt in your mind that your career as a writer would take off? Writers are always faced with that blank sheet of paper or computer screen so there are always doubts. You might get a contract, but you have to finish the book and it has to be accepted by the publishing house. All one can do about doubts is to write through them. The process itself has to be the most important thing because nothing in life--or publishing--is guaranteed. You are published by Ballantine Books, one of the most celebrated divisions of Random House. For the sake of aspiring writers that are reading this interview, tell them about the process for going from story idea to manuscript to ending up with a publisher. My story ideas come from many places. I may be inspired by a story I’ve read in a newspaper or one that has been told to me. Often a character will come first, and I’ll build a story around her. Once a I get an idea, I let it “simmer” for a couple of months until the characters come into full view. Often, I’ll do a very short, general outline of the story, but that always changes when I begin to write. Character drives plot, so I need to really know my characters before I begin to write. I usually do character bios to get a detailed sense of each character, and then I put them on stage and let them play. Equally important is setting and the point of view the story will be told from. When I’ve written the story or a much of it, I’ll say a prayer and give it to my agent who will try to sell it. Hopefully, I’ll get a contract. Publishers usually want to see a completed manuscript from a new writer and often from established ones as well. Publishing has changed in the last ten years, and I usually advise unpublished writers who can’ find an agent or to try regional or small, independent presses. When the manuscript is given to the editor, she will accept or reject it and write a revision letter. I’ll incorporate her suggestions into the piece. When I’ve completed the revision, she’ll pass it on to a copy editor for copy editing. It will then will come back to me for a final review with the copy editor’s revisions. 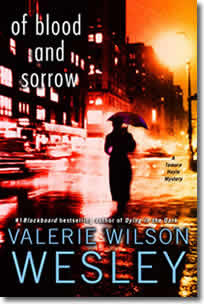 Of Blood and Sorrow was the novel I read this year. It was released earlier this year and continued your series. I think one of the most intriguing qualities about your career is that you have not been pigeon-holed as just another black author. Your books have cross-over appeal How much of that was your goal? I’m an African-American woman writer, but I write about things that concern all people–regardless of race or gender. Strong plots are always universal, and well-drawn characters are full, rich people whom readers connect to regardless of a writer’s ethnicity. A good book is a good book and writing a good book with believable characters and a strong plot is always my main goal. Children’s books seem to be something else you are gifted at writing. What can we expect next from you on the literary front? I’m currently working on a proposal for a new novel, and shortly after that I’ll start one for a new Tamara Hayle Mystery. Wish me luck! Any other advice you want to give writers who seem to write outside the box of what would be expected of them? Yes, be true to your spirit as a storyteller and respect the craft, which means taking your writing very seriously and learning as much as you can from the masters. Thank you again for this opportunity, Valerie. If our readers would like to find out more about you online or purchase your books, how can they do so? There’s my website www.tamarahayle.com. It promises a blog, but I must confess, I haven’t begun blogging yet. I hope to start a blog very soon. Most of my books can be purchased through www.amazon.com, www.borders.com and other book outlets. And thank you so much, Cyrus, for giving me the opportunity to talk to readers!